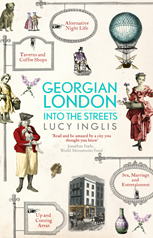 I saw the gestation of Georgian London: Into the streets by Lucy Inglis, so now it is born – I had to buy it! 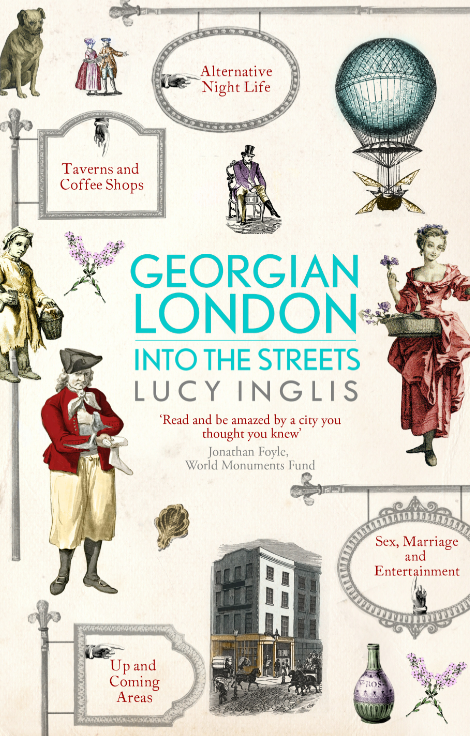 Lucy Inglis has been blogging about Georgian London for much of the last four years, and I have been reading since then. Her focus is the stories of everyday folk, little snippets from contemporary records surrounded by her extensive knowledge of the period. The book starts with some scene settings, in particular the end of the Restoration (1660), the Plague (1665), the Great Fire of London (1666) and the Glorious Revolution (1688). These events shape the stage for the Georgian period which covers the years 1714 to 1837, named for the succession of King George’s who reigned through the period marked by the death of William IV (don’t ask me). London is then covered geographically, using John Rocque’s rather fabulous 1746 map as ornamentation. What is obvious to even those such as myself who are broadly ignorant of the geography of London is how much smaller London was then. Areas such as Islington, which I consider to be in the heart of London were on the edge of the city at the time, rural locations with farming and so forth. The period saw a huge expansion in the city from a population of 500,000 at the beginning of the period to 1.5 million by 1831 which much of the growth occurring in the second half of the 18th century. It struck me how the nature of poverty changed with urbanisation; prior to a move to the city the poor could rely to some extent on the support of their parish, moving to London broke these ties and, particularly for women supporting children, this led to destitution. Men could easily travel to find work, either back home or elsewhere – a women with a child couldn’t do this. The role of the state was rather smaller than it is now, when the time came to build Westminster Bridge, there was no government funding but rather a series of lotteries. The prize for one of these was the Jernegan cistern, a wine container made from quarter of a ton of silver with a capacity of 60 gallons! Another indicator of the smaller size of the state was that in 1730 a quarter of state income was from tax on alcohol, much of it on gin. Currently alcohol duties account for about £10billion per year which is about 1.5% of the total government spending. Businesswomen make regular appearances through the book, for example such as Elinor James who was the widow of a printer, Thomas James but published under her own name. She was both a speaker and a pamphleteer, working at the beginning of the 18th century. At the end of the century, the younger Eleanor Coade, was running a thriving business making artificial stone (Coade stone). She’d first come to London in 1769, with her mother, also Eleanor following the death of her father. At the same time that a quarter of all government revenue came from alcohol duties, a quarter of all gin distillers were women. Alcohol caused many social problems, particularly in the second quarter of the 18th century, as recorded by Hogarth’s “Gin Line”. The vice of the upper classes in the second half of the 18th century was gambling. The Tower of London housed exotic animals for many years, providing a money-raising visitor attraction through the Georgian period, only losing it status in 1835 on the creation of London Zoo in Regent’s Park. A few years earlier, in 1832, the Tower of London hosted 280 beasts of varying types but it was becoming clear it was an unsuitable location to keep animals. The British were also becoming more aware of animal cruelty, with animal baiting becoming less popular through the Georgian period – culminating with the Act to Prevent the Cruel and Improper Treatment in 1822, and the formation of the RSPCA a couple years later. It seems useful to know that London’s first street numbers where introduced in 1708. The voice of the book is spot-on, conversational but authoritative, providing colour without clumsiness. There are no footnotes but there are extensive notes at the end of the book, along with a bibliography. For someone trying to write a blog post like this, the index could do with extension! It’s difficult to write a review of a book by someone you know, all I can say is that if I didn’t like it I would have not written this. Don’t just take it from me – see what the Sunday Sport thought!